Vithappa Fair is Celebration in Vithappa Villege in Karnataka India.Vithappa Fair is Large Three Days Celebration in Karnataka.People of the village of Vithappa in Karnataka hold the Sri Vithappa fair in honor of the eponymous deity of the village. The fair, which is held for three days immediately after the traditional festival of Shigi Hunnive, attracts a large congregation of devotees from adjoining areas. As per the religious observations, a procession is taken out with devotees carrying the holy deity in a palanquin. The procession is accompanied by about 60 parties of drummers assembled from different parts of the state. Devotees offer animal sacrifices to appease the deity of Vithappa. The Pujari sells them and the amount realized is credited to the temple funds. This fair takes place immediately after the traditional festival of Shigi Hunnive. Thus is attracts a lot of crowd. 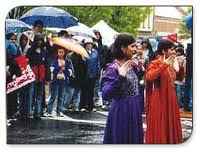 The fair holds a folk and religious importance. The main feature of the fair is the religious procession followed by drummers. The procession is taken out in the day of the festival and people follow the procession in huge crowds. The deity is being carried in a palanquin. 60 parties of drummers assemble at the village from different parts of the country to follow the procession during the festival. 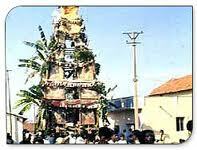 Sacrifice if animal is a very common ritual of the festival. The animals for sacrifice are available from the priests who sell them. The amounts raised by selling the animals are accredited to the temple funds. Devotees who come to Sri Vithappa Fair believe that if the milk which they bring for offering turns into curd before offering then it is considered as good omen. During Sri Vithappa Fair there is another ritual of collecting grains from a container kept in the temple by any person in Chunchanoor village and if these grains are sowed in the field good crops are expected to yield. Devotees offer animal sacrifices to appease the deity of Vithappa. The Pujari sells them and the amount realized is credited to the temple funds.A number of religious beliefs are associated with the Sri Vithappa fair. Devotees regard it a good portent if the milk brought by them gets converted into curds before offering it to the deity. This fair, which is being conducted for the last 200 years, usually falls on the 14th and 15th day of the month Aswija. The fair is organized with high festive spirits as the celebrations are marked by the grand procession with devotees carrying the holy deity in a palanquin. 60 parties of drummers from different parts of Karnataka also accompany the holy procession. There is also trend of offering the sacrificed sheep before the deity which is later sold by the priest or pujariand the amount gained is credited to the temple funds. There are many religious beliefs associated with the Sri Vithappa fair like turning of milk (brought for offering) into curd before offering to god is considered a good omen. Another trait related with the fair is the collection of grains from bag kept in the temple by a person from Chunchanoor village during the fair. It is believed that if these grains are sowed into the farms then will result in rich yield for that very year. This fair is held in the honour of Vithappa, the deity of the village, Vithappa. It is a three days festival and about 7 to 8 thousand people gather during the fair. 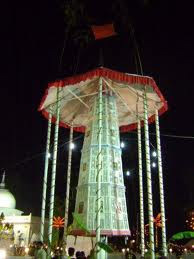 This fair has a religious and folk importance.Sri Vithappa fair is held in honour of Vithappa deity of the village. time. The deity is taken out in a palanquinin a parade accompanied by about 60 parties of drummers from different parts of the state. The devotees offer sheep to the deity. The Pujari sells them and the amount realized is credited to the temple funds. Devotees bring pure milk and they consider it a good omen if it gets converted into curds before offering it to the deity. Another feature of this fair is that a person from Chunchanoor village picks out some grains in his palm from a number of bags kept in the temple. The grain he picks out is then to be the harvest which will have wealthy yield that year. Transport : Badami is connected by road to Pattadakal (22 kms), Aihole (44 kms) and Hubli (110 kms). Karnataka State Transport Corporation buses ply from Badami to different major locations of te state.